The wide, Windsor reverse apex shed offers something different from the norm. With its Shiplap exterior, it has been designed with both longevity and quality in mind. To the front of the shed you’ll find a large rectangular styrene glazed window. Used for its 100% shatterproof benefits, styrene is known to be much safer than glass, making it suitable for family homes. A wide single door is also located towards the front edge of the shed, giving you more than enough access into the building. The reverse apex roof gives it a more unusual design, though it still provides the same great benefits as the traditional apex roof. One of these benefits is the tall interior, providing more head space to walk around in than other roof designs. Though the interior is created from slightly cheaper materials, the round edge framing is a nice addition. This style of frame acts as a barrier against moisture, as well as offering a smoother look and feel. 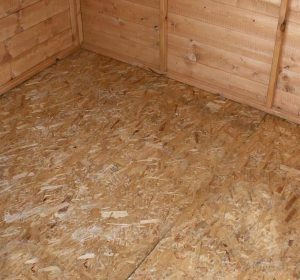 This shed isn’t constructed for heavyweight storage, but it is possible to boost the floor’s strength by adding another solid wood sheet. 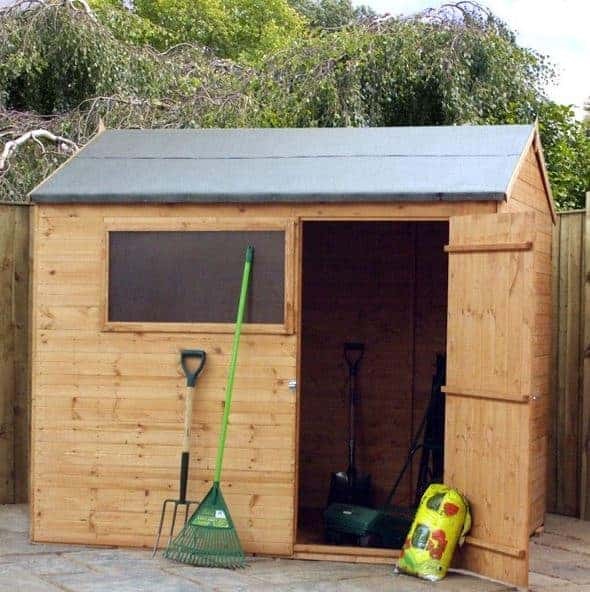 Overall if you want a simple storage shed with a unique look then this model is a great choice. Armed with a 10 year guarantee, you can be sure with annual treatments you are really getting your money’s worth. Solid sheet floor isn’t suitable for heavyweight storage. With some DIY skills you could enhance its strength however. h however. 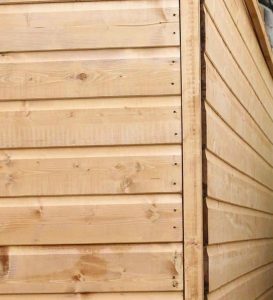 The mid-size Windsor Shiplap Reverse Apex Shed offers ample space to store all of your outdoor furniture and equipment. However, its interior is constructed from solid sheet board which means it isn’t going to be suitable for large, heavy equipment. Though advertised as an 8’x6’ building, as you can see from the depth and width, the exact measurements are a little different. It comes with a slightly taller design than many other similar buildings and the door also has a particularly wide style. However, the height of the door is pretty low so it is possible you will need to duck a little before you enter. Not many sheds these days incorporate a reverse apex design. Therefore this one does stand out from the majority. It basically means that instead of sloping down either side of the shed, instead the roof slopes front to back. As you will see in the picture, this design also makes it easier to assemble the building in a corner of the garden. It does come with free roofing felt, but unfortunately this isn’t made from high quality materials. You might want to buy a better felt elsewhere prior to the sheds delivery and install that instead. The one thing we feel let down by with this shed’s design is the solid sheet floor. This chipboard style material is often found inside modern sheds, but at this price range it is slightly disappointing that it isn’t made from tougher materials. It basically means that storing anything heavy will be a problem. 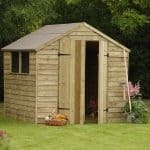 So unless you want to strengthen it yourself, we would only recommend this shed to those with lightweight or medium weight storage requirements. 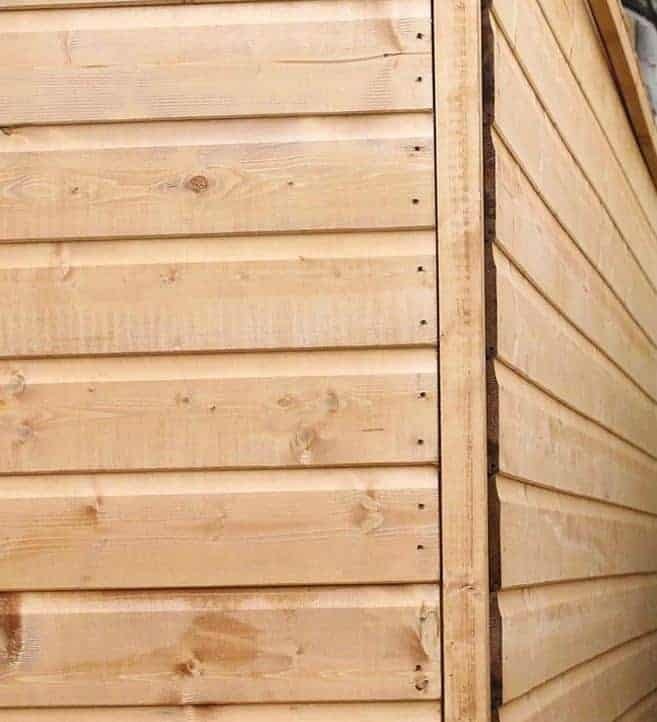 The interior of this shed may be created from cost cutting materials, but the exterior walls have been built from high quality tongue and groove Shiplap cladding. This makes it much more weather resistant than its overlap competitors. Shiplap is strong, sturdy and naturally water resistant thanks to the ingenious little channels incorporated into its design. These are situated between each panel and they filter rain away from the shed, preventing it from building up and causing problems such as fungus and rot. Interlocking panels created by the tongue and groove element of the design also help to keep out drafts, protecting the building from strong winds. Round edge 28mm x 28mm framing is used to strengthen the interior. The rounded design makes the frame moisture proof and also aids with stability. There is a 10 year anti rot guarantee supplied with the building, but this will only apply if you treat it well. A dip treatment is applied before shipment, but it is advised to retreat the timber shortly after assembly and then continue treatments each year. 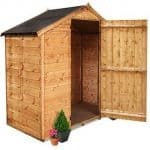 As an extra benefit, Shed Store do supply a free 5l treatment with this model. With the reverse style you’ll find the door and window are located on the front of the building. This is actually a practical benefit as well as a more attractive one. Front facing windows tend to offer more light into the shed than side facing ones. The window is fixed so you won’t be able to ventilate the shed unless you leave the door open in the hotter months. It is glazed with styrene so unlike glass it is actually shatterproof. This gives you peace of mind if you have pets or children as if they are broken they are a lot less likely to cause an injury than glass. The single door is offset to the front side of the shed and it benefits from a wide opening design. The manufacturer has added a pad bolt to the door, but this purely stops it from swinging open in strong winds. If you want to secure the building you will need to buy a padlock. Though this isn’t offered as an extra, Shed Store do supply them. Though only one window is included in the shed’s design, it is a really large window that covers most of the front of the shed. So privacy isn’t something you get a lot of with this model. We’d encourage installing curtains to cover the window if this is an issue. 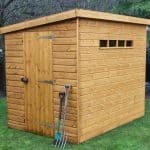 Though there are a few good extras available with this shed, we are disappointed one particular thing has been left out. As the shed doesn’t come with a padlock, but it is fitted with a pad bolt, we would have expected to see one offered as an extra; especially as they do sell them. What is available is a Garden Building Installation Service. Shed Store don’t give an estimation of how long this shed is likely going to take to construct, but there may be parts of the installation you find difficult, such as placing the reverse apex roof. However, the cost of this service is really high so you need to think about whether the reduced stress is worth the increased cost. The four different treatments are useful if you want to change the colour of the shed. However, Shed Store provide a 5l tub of free treatment with the shed so if you’re focused on saving money you could just use that for the first year. Your last additional option is the Assembly Assistance Tool Kit. This is probably the least useful extra, though if you don’t already have a range of tools you might find it worth investing in. It comes with a saw, brushes, safety goggles, a hammer and a safety knife to name just a few. 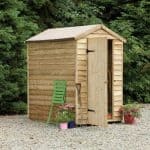 It isn’t just going to come in useful for this shed; it will also aid you in the erection of future outdoor buildings too as well as with other DIY tasks. Though the walls are created with Shiplap tongue and groove cladding, it doesn’t have the best quality design. The interior materials for example are very thin and flimsy. However, it does come at a good price so the quality you’re paying for is really good. The cladding will last a minimum of 10 years if you treat it properly. However, you will need to be careful with the solid sheet floor. If you store anything heavy without strengthening the floor, it will become damaged over time. The 8’x6’ sized sheds tend to be the most popular. This is a medium size building that will fulfil most people’s storage needs. Of course, you can also add shelves if you need to thanks to the cladding’s excellent strength. Unlike some of their other models, the manufacturer doesn’t give an estimated construction time. It is likely going to take up to 4 hours to build. All fixings, styrene and instructions are supplied so you shouldn’t have any issues putting it together. 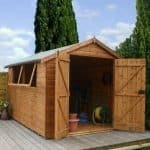 You are receiving great value for money with this shed, but you will still need to spend a little extra on maintaining and upgrading it. Final Thoughts: Reverse apex sheds are an ideal alternative to the traditional style buildings out there. This one forms part of the Windsor collection and it has been manufactured with value for money in mind. Though parts of it could definitely benefit from a few improvements, overall it does offer some pretty good features. The front facing shatterproof window filters in more light than a side window and we also love the width of the door; enabling you to get wider tools and items into the shed with ease. A 10 year guarantee against rot gives you reassurance that the shed will last the test of time. All in all it’s a good quality building with an attractive design.